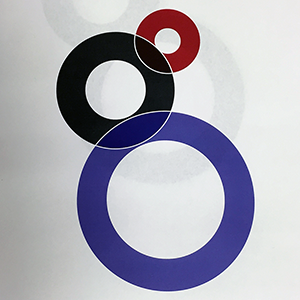 Coursework at Texas State led me on new typographic paths. I've never considered myself a type expert, but these experiences were a celebration of letterforms! Create an animated title sequence featuring five type designers or experts to promote typography conference TypeCon 2011, held in New Orleans, Louisiana. I explored the culture of New Orleans to set the theme. Next, I selected type specimens to feature. I storyboarded the different scenes to help plan the details. I used Adobe Illustrator and a Wacom Cintiq tablet to create each frame. I created type samples online, tracing them to preserve their styles while also matching my hand drawn scenes. 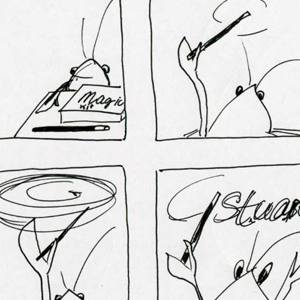 A hand drawn animation of a friendly crawfish character (an icon of the host city and state) interacting with type specimens to showcase the work of featured speakers. This project won the Juror’s Award at our M.F.A. show, one of the judges said it was the only project that had levity! Prague-based type designer Jan Tomas visited Texas State for a workshop. Jan and a group of students from the M.F.A. program worked together to create a typographic project. Each participant was tasked with designing a letter to help spell out Communication Design. I was assigned the letter g.
I explored various examples of lowercase g letters and settled upon a geometric approach, finding it satisfying to create a bold ear and a descender with a spacious bowl. The first round of designs were created in black and white. Participants in the workshop enjoyed the work so much that we continued with additional meetings to add color, motion and sound. This project inspired me to take my creation further and start designing a typeface—something I had never done. To create dimensional type in a physical form to be used for the title of a museum exhibition. The spark that inspired this project was an exhibit at the Harvard Museum of Natural History about birds and their eggs. I added to the exhibit storyline for the purposes of my project: exploring the ways feathered engineers (birds) build safe nests for laying eggs and raising hatchlings. The exhibit type worked to illustrate the ingenuity of birds by showing how they might choose a nesting site in unusual locations, such as in spaces inside the letters of signs. This was further demonstrated by including materials used by birds—both natural and those left by humans. Dimensional letter forms were designed to be attached to the exhibit space wall. 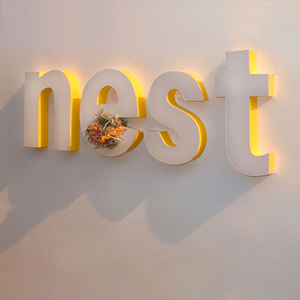 Letters were cut out of styrofoam, forming the word nest. Letter faces were covered with pearlescent white paper, the sides in shiny bright yellow, creating a visual showcase for nesting materials.